Low-E retains expensive, winter heat inside, while capturing the sun's free solar heat from outside. The properties of Low-E that keep the indoor heat in also keeps the outdoor heat out. That’s a big benefit! 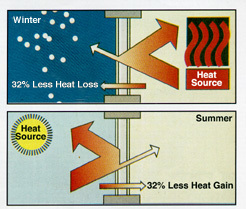 Heat that cannot enter does not have to be removed by costly air conditioning. Blocks up to 68% of the heat that could be lost with normal glazing and reradiates the heat back into the room. Blocks up to 54% of ultraviolet rays that can fade furniture, carpets and draperies. Reduces condensation. Retains expensive winter heat. windows' energy efficiency—and lower your energy bills! 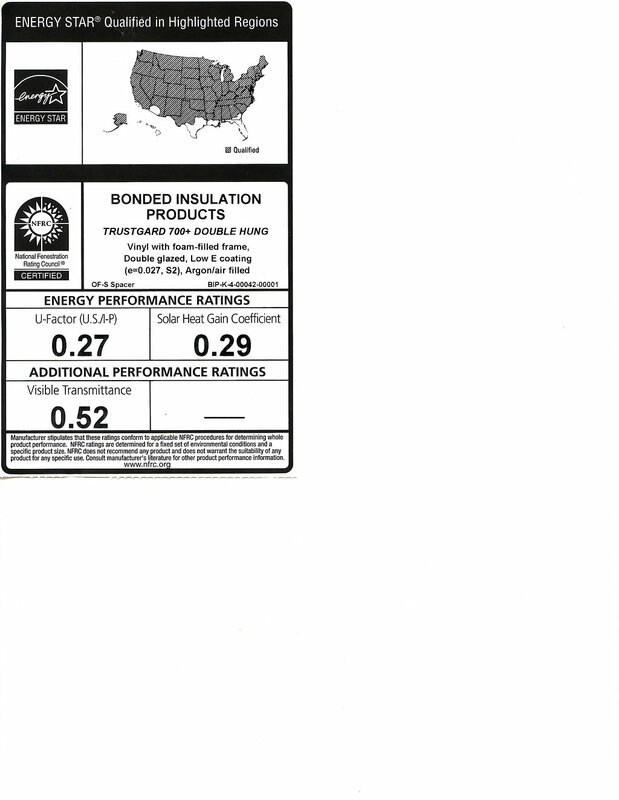 Achieve a "U-Value" of .22 with this option and qualify for the 2011 Energy Credit of 10%. one layer of clear annealed glass. 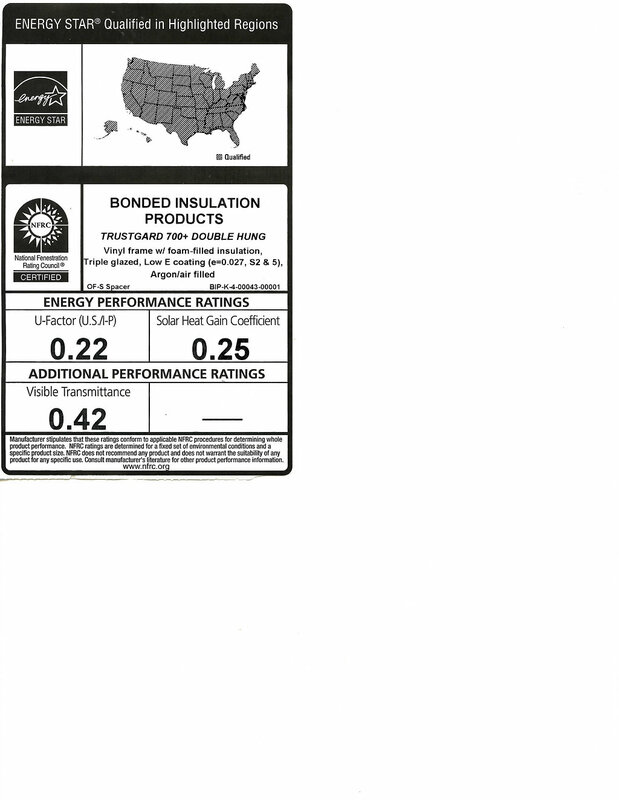 NFRC Label with the Energy Star rating imprinted. Triple Glazed and Dual Sealed using 2 layers of Titanium High Performance Low-E Glass and one layer of clear annealed glass. how do I pick the one I need? which are then sealed together using various methods. are built with insulated glass. 3. Annealed glass is breakable window glass. absorption of solar heat in the summer months. together to create a single sheet of glass. Difficult to break, yet easy to crack. 7. Single Strength Glass: Glass that has an overall thickness of 3/32"
8. Double Strength Glass: Glass that has an overall thickness of 1/8"
Glass thickness will affect the quantity of tint. 11. Mirrorpane is reflective to the lit side, commonly known as 1 way glass. 12. Wire glass is used in 40 minute fire code required areas. It has no safety considerations. Patterns can be Misco diamond or Georgian square. 13. Ceramic glasses are clear porcelains comprised of different materials which have substantially better qualities in heated environments than wire glass. Typically these are 1 hour rated for window use. Substantially more expensive than wire glass. 14. Warm Edge Air Spacers are the separators between the glasses that comprise an insulated glass unit. Composed of materials that are poor conductors of heat and cold, thus reducing the effect that environmental termperatures have on the inner and outer glasses that comprise an insulated glass unit. 15. Inside the glass muntin bars are grid systems, typically aluminum, suspended permanently inbetween the spacers and glasses, that create a pattern representative of small panes of glass. 16. Argon gas is a dense inert gas found in the air we breathe. Use of argon gas slows the radiation of heat and cold through the air space created by air spacers as described above. 17. Mini-Blinds for windows are 5/8" wide aluminum slats that tilt open and closed. They are installed permanently inbetween the glass panes. They operate effortlessly with one finger. 1. Choose a a glass product the suits your geographic location. Southern areas should use a glass with a lower solar heat gain. Mid and Northern climes should use a Low-E product with a higher solar heat gain for free "heat" from the sun. Better (lower number) U-Values may not be the only indicator of a better glass package for your area. 2. Safety and security glasses are different from each other. You can use security glass like laminated for safety areas, but you shouldn't use safety glass for security. Tempered glass is great fun to watch as it breaks. 3. Tinted is similar to a pair of sunglasses. Is there a glare problem where you are? 4. Argon gas is used to increase the overall performance of the insulated glass. Krypton is more efficient but much more expensive. Krypton works better in smaller air spaces such as used in triple glazing. All gases will leak over time, it's physics. Investigate the type of spacer and sealant used. These items affect the speed of transference. Bonded uses the ultimate warm edge spacer: Edgetech Super Spacer® and Delchem Butyl Sealant D-2000, a combination which has been tested to have the slowest leak rate of available alternatives. Average leak time, 20 years. Remember: gas fills the space almost 100%. As argon is exchanged with air, the fill rate is still close to 100%, there are just less molecules of gas to fill the space. 5. Wire glass is not safety glass. It's use is primarily for fire code applications.